One of the first “fancy” stitches I learned was this easy popcorn like stitch, and I am delighted with how the Popping Gray Cowl turned out with the use of this simple stitch. Beginners, have no fear. You can crochet this lovely fall piece. 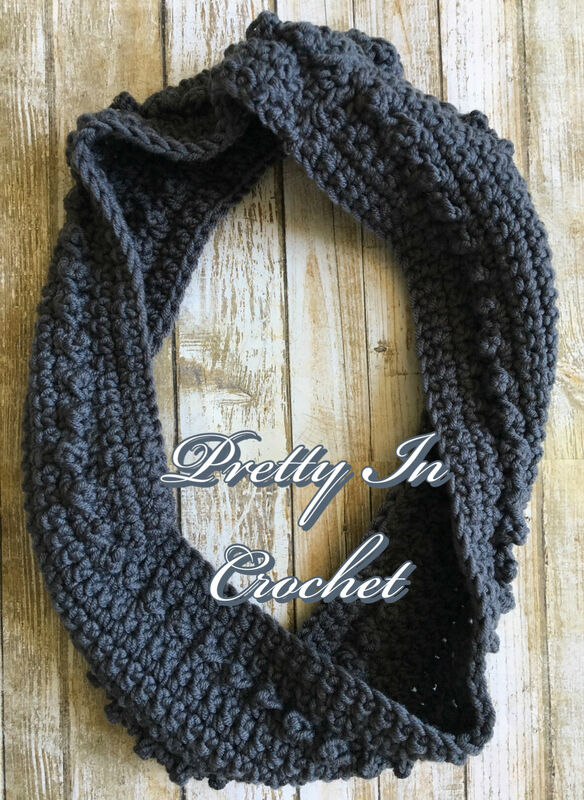 And as promised, Pretty In Crochet continues to deliver free patterns 🙂 I created this blog primarily to share great patterns with you–my own, and those of others, and I try and point you to the free ones. I do purchase a good many patterns, and I intend to write up a post about some of my favourite designers that I purchase from, since you ought know about great patterns period. But more about that later, And although, today’s pattern is a freebie, you are always welcome to visit my Ravelry store 😉 Cuz those patterns are equally awesome and deserve some love. Fall is here my friends. There is no denying it, I see it in the leaves. I feel it in the air. And I love it! No, I don’t look forward to long winter months ahead, but fall is so wonderful. So I hope I can share many fall patterns with you, starting with this cozy piece. 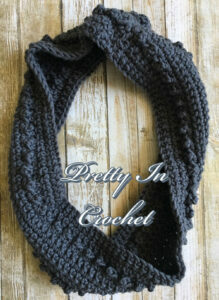 The Popping Gray Cowl will look awesome under a leather jacket. I’m thinking a red leather jacket, but it’ll do fine with a black one too. 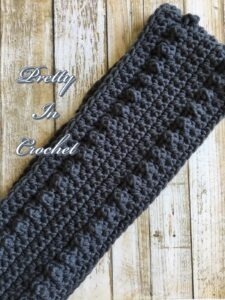 And the bit of texture the alternating treble and single crochet creates makes this piece eye catching even though it’s…well, gray. As you all know, I love colour, so this cowl was made with someone else in mind, but I know many of you will love the neutral shade of this squishy merino wool by Sugarbush. And you will adore the yarn, I promise you. You can opt to use another aran yarn, but I do encourage you to give Sugarbush a try if you haven’t yet. Trust me, you will not be disappointed. Each of their yarns is a dream. Gauge is not very important in for this project. ROW ONE: Ch 112; in second chain from hook, sc in st, and in ea st after. Ch 1, turn. ROW TWO: In first st, sc, and in ea st after. Ch 1, turn. ROW THREE: Repeat row two. ROW FOUR: In first st, *tr, in next, sc. Repeat from * till end of row. Ch 1, turn. ROW FIVE: Repeat row four. ROW SIX-TWELVE: Repeat row two. ROW THIRTEEN-FOURTEEN: Repeat row four. ROW FIFTEEN-SEVENTEEN: Repeat row two. Fasten off and weave in ends. Fold cowl in half, end to end, with the popping stitches created by the treble and single crochet stitches facing outwards. Stitch together with the craft needle. Weave in loose ends. All done! It’s that easy I promise you. 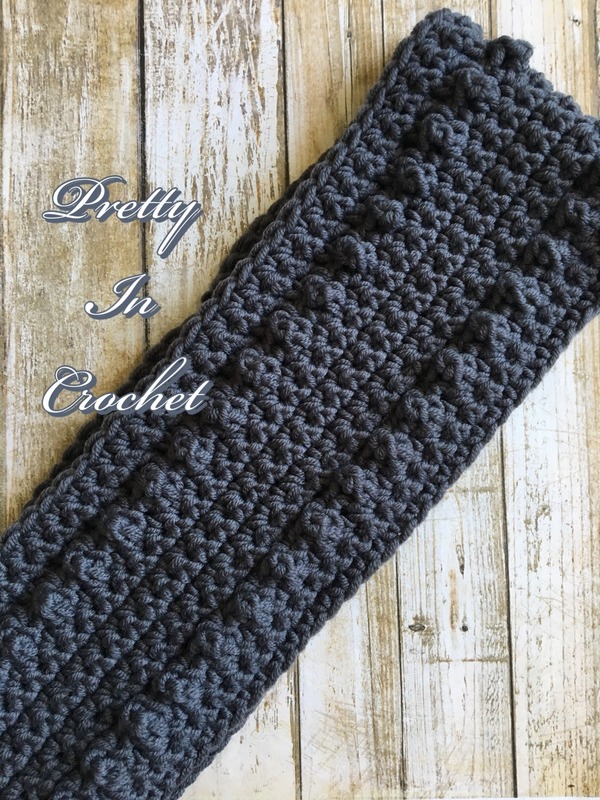 I really hope you enjoy this pattern, and remember to tag photos of your piece with #prettyincrochet on Instagram so I can see your popping gray cowl. Or, whichever colour you might choose to hook this up in! At the end of Row 4 I end up with a treble crochet, is that right?